Oil and gas producer Chesapeake Energy has signed a long-term frac sand supply agreement with Hi-Crush Partners for Northern White sand. The agreement between the Oklahoma City oil and gas company and the Houston frac sand supplier will supply sand to Chesapeake's operations in Pennsylvania's Marcellus shale and the Powder River Basin in Wyoming. I have a long time friend in Denver who sells fracture sand for a supplier there. He tells me that none of his company's clients use natural sand. They all use ceramic or other synthetic proppants, presumably due to increased crush resistance, When proppant becomes crushed from the adjacent rock closure stresses, fines are created that can plug the proppant permeability and impede production. A long time player like Chesapeake should know this. I'm surprised that they would chose natural sand for a proppant. maybe it's because they don't plan on being in biz that long. just get the oil&gas flowing now,make their$,then get out. 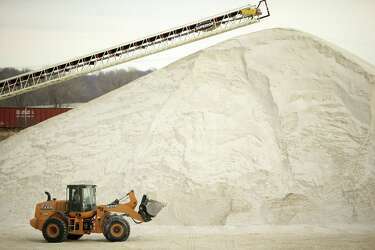 the vast majority of sand used is natural white. there is a move towards cheaper brown grades in blends including specific size blend ratios rather than just a singular size. ceramic is effective but at high loading rates of up to 2600lbs/ft. much higher cost. might be interesting to see ceramic blended in with naturals and the effect on well decline rates. regarding "crush". prior to George Mitchell's company solving the hydro-fracing puzzle, there was a plan with DOE, to detonate an underground nuke in the Barnett. without proppant that may have resulted in the "ultimate crush".